With a little help from Anabela, I finally located a couple copies of the newest issue of Stitch magazine at Presse Internationale. There’s a nice mention of the workroom with a couple great photos. (that’s Anabela’s quilt, Grant, Rosalyn and Michelle in the top photo!) This piece came about because Jacqueline of Soak kindly mentioned the workroom and put me in touch with one of the editors. It’s such a treat to be on the same pages as so many great talents in this new magazine. 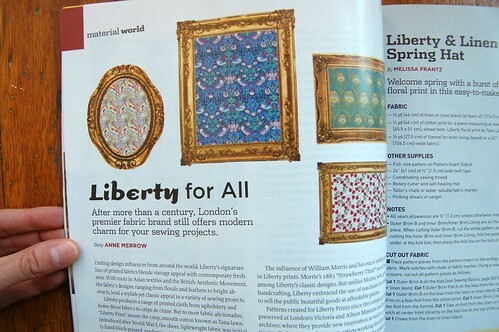 There is an informative article on Liberty of London fabrics (they are coming in the next couple weeks! ), people who are printing their own textiles (Lena Corwin, Ink & Spindle and Lotta Jansdotter) and tons of cool projects and patterns. I’m going to get myself a subscription so that I don’t have to run around the city trying to locate a copy. Plus, I want to make sure this magazine stays in print. I know there are a few people trying to find copies, so please comment if you see a copy somewhere in the city. Michelle said there were lots of copies today at the Indigo at Bay & Bloor. Thanks so much to everyone who emailed and tweeted when they saw the article. It’s great to see how popular this publication is already! I got my copy yesterday! I had to order it from the US but it was worth it. I really enjoyed seeing pictures of The Workroom there! And Anabela’s quilt made me remember how I first discovered Field Guided: it was via photos of that same quilt on Flickr. I’ve bought this before at the Walmart *blush*. It can also be ordered from within Canada – Stonehouse Crafts carries it and I just purchased the first issue a couple of weeks ago. I’ll be on the lookout for the new issue in Montreal. Thanks for the heads up Karyn! I’ve been looking to get a copy and will head over to the Bay/Bloor Indigo during my lunch break to see if there are any copies left! Yay! I’m going to pick up a copy at the Presse Internationale on the Danforth today (near Chester station). I espied them in the window yesterday, but my pockets were empty. I picked up a copy last night at the Loblaws at St Clair and Bathurst. 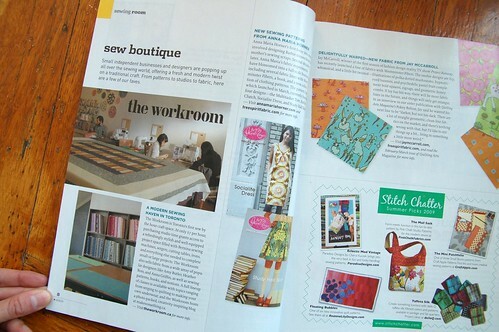 I was pleasently suprised to find the workroom gracing the pages of Stitch! The Indigo at the Eaton Centre had lot’s of copies. I love stitch and you must be thrilld to have an article about the workroom. where did you find a way to subscribe? maybe i’m not seeing it, but i only see options to buy single issues on the website that you linked. 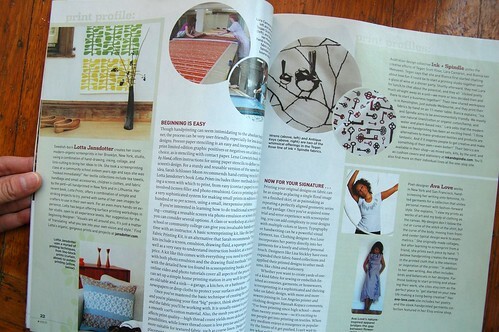 Karyn you should just start carrying a select few of cool craft magazines to sell at the studio! this is great! 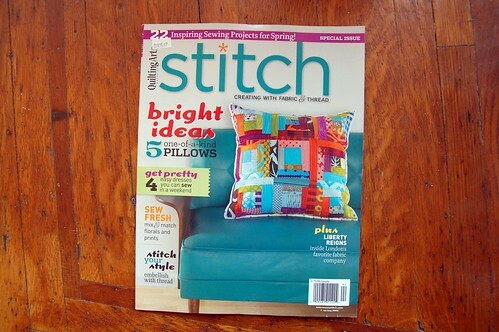 thanks for sharing your spottings of Stitch mag around the city (& in the Yukon!). jing – actually i just found out that you can’t subscribe just yet. they are producing them as special issues. you can usually pre-order though and have the individual issue sent to you by mail when it comes out. davis – yes, you’re right. magazines are next. except, since i LOVE magazines so much i’d be worried i’d also start ordering things like japanese vogue and elle decoration UK. There are copies at McNally Robinson Bookstore in the new Don Mills Shopping Centre at Lawrence and Don Mills.